Want your children to develop a passion for social justice? The Jane Addams Children's Book Award is given annually to books that "engage children in thinking about peace, justice, world community, and/or equality of the sexes and all races." This year's winners are a must for families and classrooms who care about peace on the planet (annotations are from the Jane Addams' Book Award Committee's official press release). Planting the Trees of Kenya: The Story of Wangari Maathai profiles the first woman from Africa to win the Nobel Peace Prize (2004). Environmentalist and activist Wangari Maathai founded Kenya’s Green Belt Movement (1977) in direct response to the devastated natural resources and poverty caused by the deforestation of her homeland for commercial purposes. 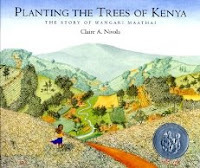 In a picture book that glows with orange and green landscapes dotted with bright blue, red, purple and yellow details, Nivola presents Maathai as a steady leader who saw community building as a way to resolve problems. She drew first on her own courage, then on the courage of many women, to sow seeds, nurture seedlings and plant trees. Together, they built a movement that continues to inspire people to take charge of their lives, their land and their future. The Surrender Tree: Poems of Cuba’s Struggle for Freedom poignantly explores resistance to slavery and occupation in Cuba in the late 1800’s. Allied with the rebels fighting for independence, Rosa, born a slave and a healer, responds to bloodshed by healing compatriots and enemies alike. Moving from cave to cave in the mountains, Rosa, her husband Jose and Silvia, a child they heal and nurture, commit to peace with each herb they gather, each wound they dress, each spirit they soothe. One of many immigrant children in New York City in the 1930’s, sprited Hildamar lives with her family in close-knit community as they face weather, language, food and customs so unlike those of their beloved Puerto Rico. Their community widens and deepens when Hildamar and her cousin meet Pura Bulpré, the librarian at the local public library who not only speaks Spanish but invites families to the library to celebrate Three King’s Day! 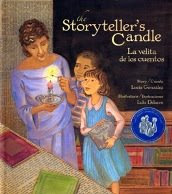 With text in Spanish and English and sepia-toned illustrations with qualities of folk art, this picture book pays tribute to Pura Bulpré, the first Puerto Rican librarian for New York Public Library—a woman who instinctively understood the importance of culture and language in building community, acted upon those instincts and brought countless children into the circle of light and literacy shed by her storyteller’s candle. Silent Music: A Story of Baghdad written and illustrated by James Rumford was also named an honor books in the Books for Younger Children category. Ali, a boy living in Baghdad today, loves soccer, parent-rattling music, dancing, and, most of all, calligraphy. His lively life, extended family and thoughtful nature flow from pages that weave calligraphy, intricate patterns and backdrops of golden brown into their design. Drawing strength from explicit visual and textual references to Iraq’s long history of literacy, the story of Ali’s passionate practice of calligraphy, first, highlights the power of literacy as a creative force in the midst of war, then, as a metaphor, invites reflection on the difficulty of practicing peace. Firmly grounded in the values and love of her extended family, Amani rejoices when her grandfather wisely grants her wish to become the first female shepherd in a line of shepherds reaching back thousands of years. But, when the family pastureland is usurped by an Israeli settlement, Amani faces challenges different from any shepherd who has gone before her. With immediacy and emotion, Carter’s novel purposefully centers on Amani’s family, its traditions and love of the land to give texture and meaning to an array of individual responses to violence and oppression. Amani’s struggle to come to grips with a world she cannot understand or accept creates a framework for addressing questions about peace, war and injustice that are of utmost importance in the world today. Ain’t Nothing But a Man tracks the real man behind the larger-than-life hero of folk song fame by following clues in the song, allusions in reference works, and discrepancies in historical records. 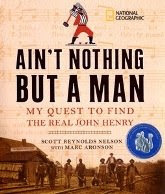 With a text that embodies the excitement of its writers, Ain’t Nothing But a Man engages through curiosity and wonder to arrive at profound questions about the life of John Henry and the 40,000 African-American men who laid tracks for the railroad in the United States in the 1800’s. Powerful photographs, cropped and enlarged throughout, underscore the importance of listening to the voices of those who have been unjustly silenced. This chronicle’s meticulous documentation bolstered by deeply-felt compassion make it clear that writing history can be a creative, humane way to address social injustice past and present. The 2009 Jane Addams Children’s Book Awards will be presented Friday, October 16th in New York City. Details about the Award event and about securing winner and honor book seals are available from the Jane Addams Peace Association (JAPA). Contact JAPA Executive Director Linda B. Belle, 777 United Nations Plaza, 6th Floor, New York, NY 10017-3521; by phone 212-682-8830; and by e-mail japa@igc.org.